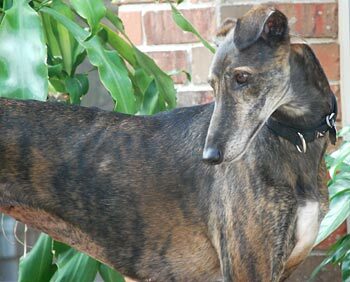 Loretta is a beautiful, dark brindle female thought to be between 4 and 5 years old. Loretta was captured by the North Texas Humane Society as a stray. Loretta is not tattooed. When she arrived she was heartworm positive, but was successfully treated under the care of Dr. Jeff Ellis of VCA Preston Park Animal Hospital and now tests negative! She is a sweet very loving girl. Loretta has been with us for quite sometime, and she's made quite the turn around from a pretty sick hound to a very happy girl! She came to us with heartworms, several intestinal parasites and a horrible upper respiratory infection. She didn't move much for the first three days but let us help her with her cold by getting some of her congestion out of her nose with a baby aspirator. 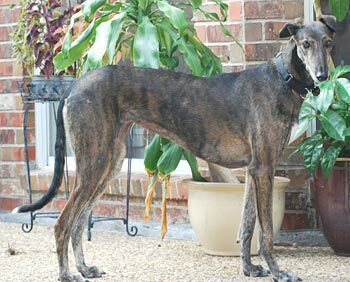 She slowly started to show interest in eating, going outside for walks and play time with her Greyhound sisters and brother. Now she bounds around and wags her tail non-stop! She has learned stairs, where her dog bed is, and how to play with toys. Loretta loves to talk! You can talk to her and she'll continue the conversation back and forth. My favorite Loretta antic is when you get down on the floor with her to pet her, she'll put her head down and start to do her forward roll. We call it her gymnastic time. She shows great interest in cats, squirrels and rabbits on our walks. She's extremely strong, so it's important to hold on tight! We're working on not pulling so much and she's starting to learn. Loretta has not been tested with inside cats yet. She is small dog friendly and seems to get along with dogs of all breeds. She isn't fond of other dogs stepping over her when she's sleeping on her bed though. She's potty trained and only had a few accidents when she first came to us. She will go in a crate for a treat, but she needs encouragement. When she goes outside, sometimes she gets excited and thinks the only reason to be outside is to have a good time. She may get distracted and forgets to potty. Be sure to watch her and make sure she does what she is supposed to do. Loretta loves her Greyhound brother and sisters. She plays well with them and loves to roll on her back and smile! We love her to pieces. She's one of the sweetest hounds I've seen and all she wants is to be loved.